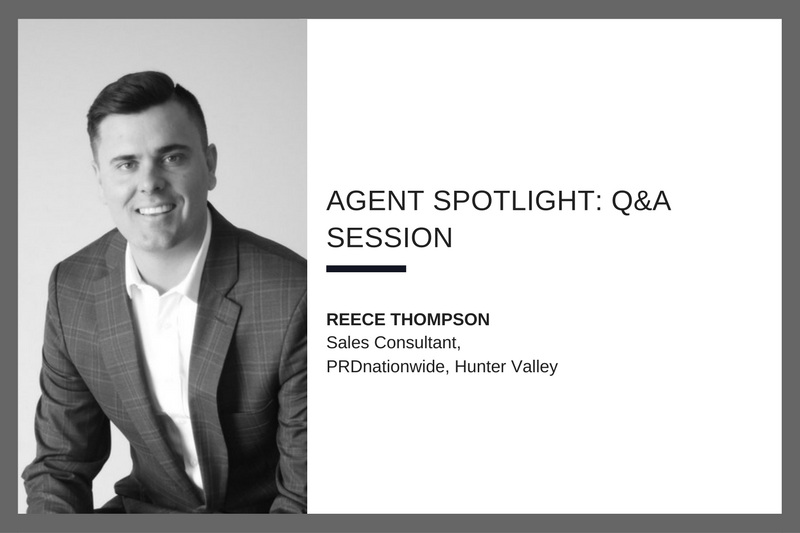 As we approach the end of the year 2017, we had a chance to sit down with Reece Thompson of PRDnationwide Hunter Valley to learn more about what it is like to be one of the top agents in Australia. Ranked no 8, Reece made it to the top 15 of REB's Dealmakers list. This prestigious list recognises Agents performance on three key metrics: deal volume, year-on-year growth, and consistency of performance. In the interview, Reece shared his approach and many pieces of valuable advice for the upcoming agents. Read on to see what he had to say. PRDnationwide: Tell us about yourself? Reece: I grew up in Hunter Valley. I started in real estate 13 years ago, and I was working with another agency, doing the sales side of things. I suppose good things happened and an opportunity presented itself from one of the biggest real estate company, PRDnationwide Hunter Valley in Maitland. I took the big leap and have never looked back ever since. PRDnationwide: How did you get your start in real estate? Reece: I grew up in Hunter Valley, and I started in real estate when I was 17. When I finished school, many friends transitioned into TAFE or Uni; I did not want to do either. I wanted a job that was half indoor, half outdoors. I thought, I was pretty good talking to people, so that is how began my real estate story. PRDnationwide: What led you to the PRDnationwide in particular? Reece: I was doing some decent numbers when I worked with the small agency. Luke Anderson knew me from before, and he called me a couple of times. I liked the way PRD office was run and the fact it was going to give me a bigger opportunity, so I jumped the boat with him. PRDnationwide: How has PRDnationwide supported you during these early years of your career? Reece: The Events and Training at PRD were good. I went from a small agency to a big one, so I had a pretty good base. Once every three months, PRD holds a zone meeting which is always good to go and brush up your skills. I find it very motivational, I go to these events to see other agents who are doing quite well. I try to pick up little things that they do and progress from there. The training and biggest database that PRD gives you to win business present you with numerous opportunities that you cannot compare it to our local market. PRDnationwide: Ranked no 8 in the REB dealmakers list – 155 properties sold in a year – what is your success story? Reece: To stay motivated, every six months, I try to do better than the last six months. Since I have joined PRD, about six years ago, it has been part of my routine. I like to set up a target like $100, 000, $200,000 for the next quarter, $400,000 and so on. I always make sure that I am consistently beating my previous cards. I am very goal driven. I know what I want in my life, I have got an investment property, a house, have got three kids and a wife. I have worked out how much money I will need if I want to go on a family holiday and how many weeks I need to match to make sure I can go on a family holiday. So I am goal driven on that. PRDnationwide: What exactly are you doing to stand out from the crowd, what makes you different? Reece: I like to set up goals and plans in place. One of the other things that drive me is competition and targets. We have pretty good agents in the office, I am not the kind of person, who sits back. If someone is doing well, I challenge and ask myself why I cannot do it too. I just take that into consideration. Another big motivating factor is my wife and three beautiful kids; I could not have done this without their support. I have a team of two assistants, they help me keep organised, and I sincerely appreciate their effort. My job is then to focus on bringing in new business. PRDnationwide: Are you using social media to your advantage? Reece: Social media just happened to me, and how I started with social media is with the local football club, and being involved in the local community. I have more than 2,000 followers on Facebook, mainly people who are local in the area. It has now become an advertising stream. Nowadays, people/local businesses contact me and ask me to advertise their product on their Facebook to get that reach to the local people. I have a video about a property I was selling that has more than 8,000 views, from that I picked up three leads which resulted in listings. However, I am just very conscious of not overdoing it. PRDnationwide: What’s your advice for the buyers? Reece: First home buyers, be prepared, it is the strong market at the moment, a piece of property which is priced right is only going to last for a week or two. You got to be prepared financially, you got to have your deposit ready to go, and don’t be afraid to make an offer. PRDnationwide: Why should people choose you as their real estate agent? Reece: In my local area, which I focus on, I fill more properties than anyone in my local area. With my local experience and the trusted local real estate brand PRDnationwide, we have got you covered. PRDnationwide: What’s your advice for other millennials looking to find success in the real estate industry? Reece: The most important thing is the hard work. You will realise that, if you do not work hard, you cannot make money. At the end of the day, I do pretty good hours, good hours for someone with the three kids and a wife as she supports me through it, it all comes down to working super hard at the end of the day. PRDnationwide: What is it like working with Luke Anderson? Reece: I do not see Luke as a boss I mainly see him as a mate. Last week we all went out for boxing, the week before that he organised tickets for the Australian Socceroos game. At PRDnationwide Hunter Valley, we have a team of sales agents who have set the bar high, I am always keeping in the forefront of the competition, and I am now looking to smash 2018 goals. Stay tuned for another agent spotlight coming next month!